The USWNT secured an Olympic berth Friday night by defeating Trinidad & Tobago in Houston. 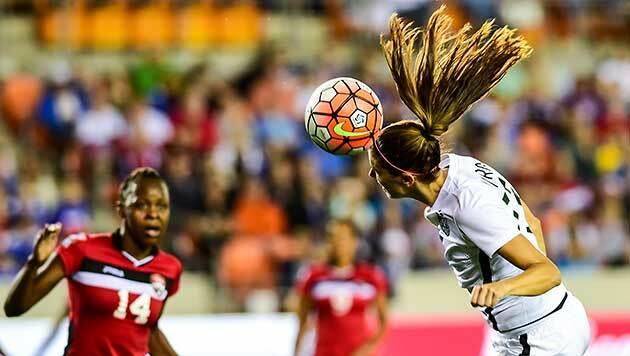 Star forward Alex Morgan had a hat trick in the 5-0 victory and Carli Lloyd scored her 24th goal in 18 matches. In the days leading up to the match she sat down with Grant Wahl in Texas to discuss her return to full fitness and her goals for 2016. Check out some of the best photos from the match at the begining and middle of this Friday night wrapup gallery. First, before getting to Daytona 500 chatter, here's your full NASCAR Sprint Cup 2016 season preview. Now, here's your Daytona 500 preview and predictions and a cool story about a child battling cancer who will go on a dream trip to Daytona. Finally, you must check out the 10 Worst NASCAR Paint Schemes of All Time and the five greatest drivers to never win the Great American Race? Remember the guy from In-N-Out Burger who ate his lunch like a savage? Sorry...apparently it was all staged. The embattled Sepp Blatter claims the "media moved in to kill me." We're six-plus months away from the 2016 season but college football never truly stops. Todd Howard, designer of Fallout, pleads with Electronic Arts to revive NCAA Football. Former Ohio State star Braxton Miller got a remarkably detailed new tattoo before the NFL Combine. Also, this first-round hopeful looks like Bane in his dramatic training photos and NCAA prez Mark Emmert opposes Michigan's spring break practices in Florida. Lastly, let's discuss the Big 12 expansion whispers. A Manchester United player was playing FIFA instead of watching his team ... What if NFL teams were cars? (Spoiler: The Rams are a U-Haul moving truck) ... The USC drumline played with Questlove on The Tonight Show and it was awesome ... Roger Goodell's role in player discipline could change ... The NHL linesman hit by Dennis Wideman still has concussion symptoms ... Steve Novak has been traded so many times that his son doesn't even know who he plays for ... Here's how to buy the Air Jordan XII The Master shoes next week ... How Bill Murray helped SNL get its Weekend Update groove back ... Combat Juggling is the best sport you've never heard about ... Ohio State football's 'Valentine's Day Massacre' workout is insane. ... Gallery: The Night in Sports (Feb. 19). Thoughts on the trailer for Ethan Hawke's movie Born to Be Blue? The film is scheduled for a limited U.S. release next month. On this day in 2003, the Sonics traded Gary Payton to the Bucks for Ray Allen and Kevin Ollie. We're just over three weeks away from Selection Sunday. Get fired up by reliving the biggest moments from the 2015 tourney.